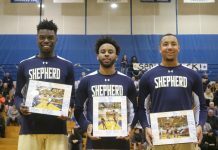 Home Players of the Month Men Shepherd Men’s Basketball falls to West Liberty in Tough Loss at Home. 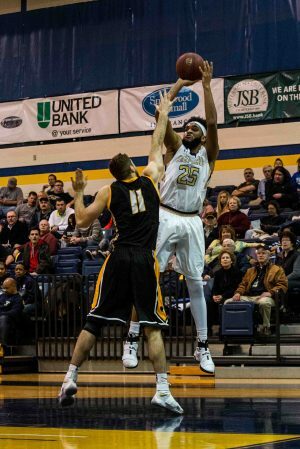 Shepherd Men’s Basketball falls to West Liberty in Tough Loss at Home. The Rams (13-8, 10-5 MEC) fell to West Liberty (20-1, 13-1 MEC, #3) 97-75 in blowout fashion on Wednesday night. 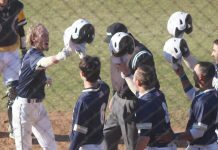 From the beginning of the game it seemed West Liberty was out to show why they are ranked number three in the Mountain East Conference. The Hilltoppers’ challenged Shepherd to match their fast-paced offense and suffocating full court defense. In the first period alone, the Rams repeatedly had difficulties advancing past mid court. This caused Shepherd’s offense to stagnate when opportunities did arise. Forward AJ Carr attempting a shot in the second half. 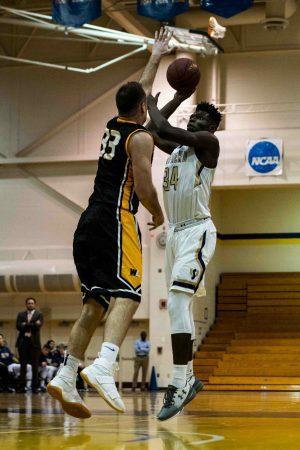 Guard David Dennis for West Liberty was an important contributor for his team notching 17 points, seven assists, and nine rebounds on an efficient 5-7 from the floor. He routinely grabbed rebounds around bigger bodies in the paint, as three of them were on the offensive glass. David Dennis’ backcourt mate, Devin Hoehn, was also important for the Hilltoppers, adding 17 points of his own. West Liberty controlled the paint for the entirety of the contest with 28 points compared to 10 for Shepherd. Another facet of the game that West Liberty won was with bench points, to the tune of 28-16. The Hilltoppers used a deeper bench then the Rams which allowed them to keep their starters fresh. Top performers for Shepherd on the night were some familiar faces in AJ Carr and Steffen Davis, but sadly it wasn’t enough. Carr totaled a game high 24 points to go along with 10 rebounds and six assists on 10-16 shooting, including two three-pointers. Guard Steffen “Downtown” Davis managed to contribute 17 points of his own despite an unusual off-night shooting (5-13, 4-11 from three) in a game where the Rams needed each bucket. Most Ram players found difficulty finding the bottom of the net. The Rams went an uncharacteristic 10-28, on 35.7 percent shooting from the three-point line. 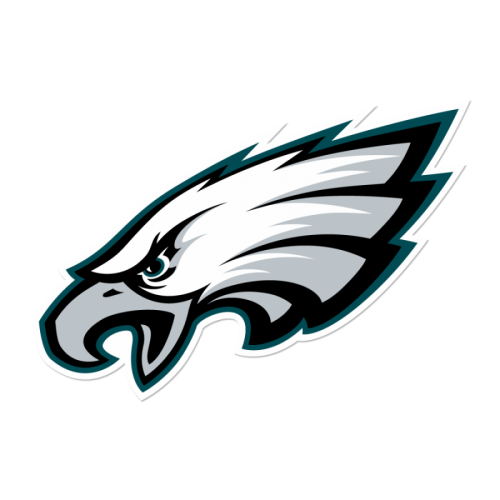 When the team relies that heavily on one aspect of the game and is unable to convert those chances; a loss should be expected to follow. Forward Winston Burgess attempts a shot in the post. 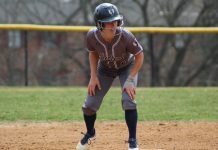 The next game for Shepherd is scheduled for Feb. 4 at Wheeling Jesuit University.